Ya Jagoff!!! | Is That "Do Not Enter" or "Donuts, Enter"
This is a big day. 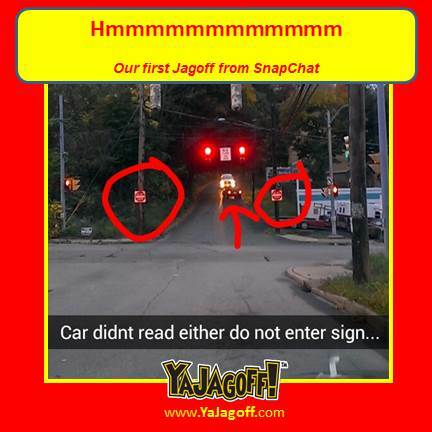 There have been Jagoff pic submissions via Facebook, Twitter, email and Instagram. This is our very first from SnapChat. At some point in this photo, one of the drivers, across the intersection, is going to say “What the??? ?” You can almost bet that the driver going the wrong way will yell and throw fingers at the driver coming head-on at him because, that’s kinda what happens around here. Nobody likes to admit they were wrong… despite the bilateral “Do Not Enter” signs. I’ll bet if the signs said, “Your cell phone won’t work past this point and you will not be able to send or receive texts” ya would have noticed, Ya Jagoff!